Welcome back to Killer Robot Week here at the Misan[trope]y Movie Blog! 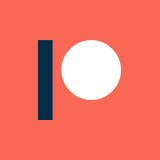 For those that missed the first entry, you can check out the “Red Planet” review here. 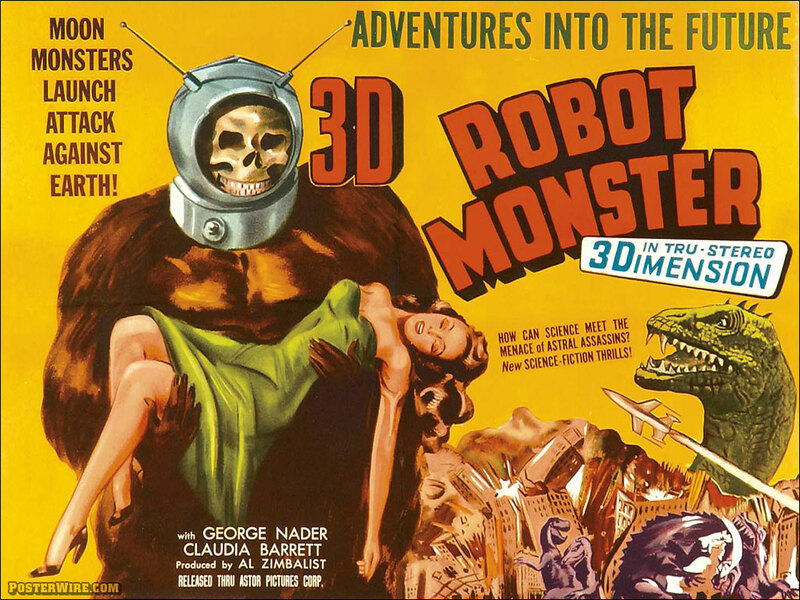 “Robot Monster” is a classic among classics in the realm of B-movies. You will rarely find an elite ranking of “good-bad” films that fails to mention it in some way, and that back-handed praise is more than deserved for this feature. 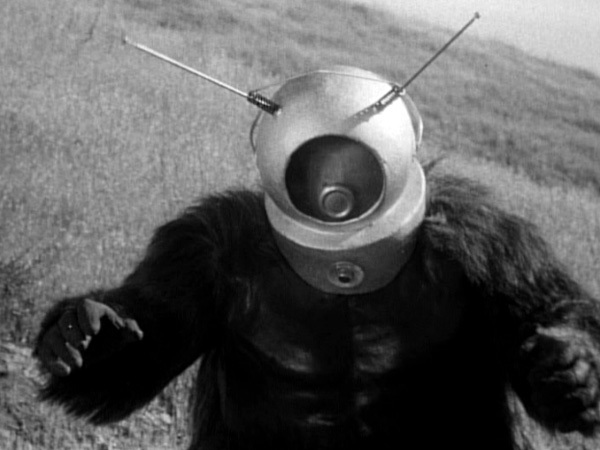 The most memorable aspect of “Robot Monster,” and what consistently keeps it mentioned in the same breath with films like “The Creeping Terror,” is the awful monster design. 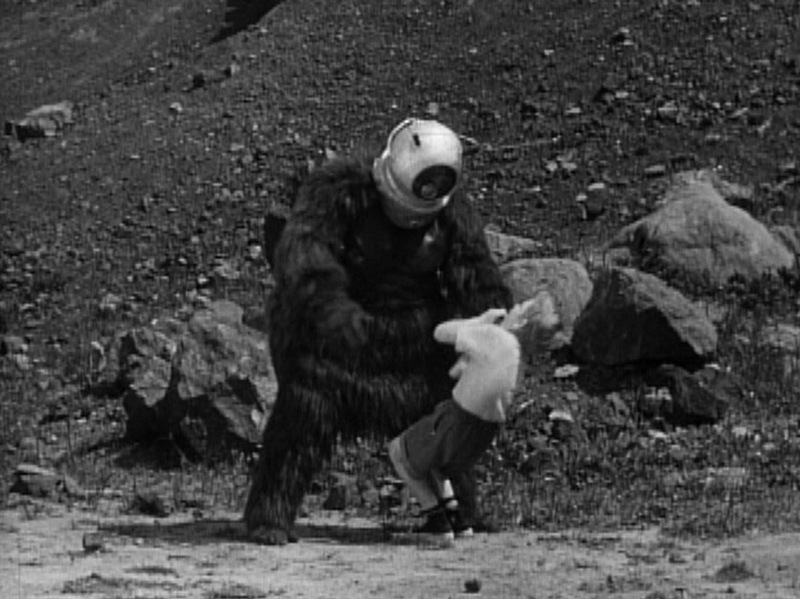 The eponymous Robot Monster, Ro-Man, is instantly recognizable by movie buffs, given his simplistic wardrobe of a gorilla suit and a slightly modified diving helmet. I’ve mentioned before that a poor monster design isn’t a death sentence for a movie, but “Robot Monster” makes a lot of the same mistakes in that department that “The Creeping Terror” does: most notably, the embarrassingly awful monster gets way too much exposure and screen-time. The only way you can get away with a bad monster is by being creative with its absence, which can’t very well happen if the creature is never absent. [Ro-man]: I cannot – yet I must. How do you calculate that? At what point on the graph do “must” and “cannot” meet? Yet I must – but I cannot! [Ro-Man]: Hu-mans, listen to me. Due to an error in calculation, there are still a few of you left. [Johnny]: I think you are just a big bully, picking on those smaller than you are! [Ro-Man]: Now I will kill you. It certainly doesn’t help the dialogue that the acting isn’t exactly stellar to begin with. The movie features not one, but two major child characters, which is almost always a recipe for disaster. As you might expect, the two precocious kids can’t act with a damn, and are on screen almost as much as the robot monster himself. The rest of the characters include an elderly scientist and a love-hate couple, none of which are portrayed much better than the kids. There is an interesting question that I had to ask myself while watching this movie: is Ro-Man, as the title suggests, actually a robot? It seems like a necessary question to ask, given this is Killer Robot Week and all. His behavior and speech are very mechanical and robotic until later in the film, which seems to be a trait of his race (also called Ro-Man? There’s an anti-individualism aspect to them). It is also unclear if the diving helmet is part of a uniform / space suit, or if it is biologically part of the creature. Ro-Man’s commander, who is not on the planet, also wears the same helmet, so I don’t think it is a necessary breathing apparatus. In any case, I’m tempted to say that the Ro-Man are a sort of cyborg race, which incorporates both robotic and biological aspects. Interestingly enough, the term “cyborg” wouldn’t be officially coined for another 7 years after the release of “Robot Monster,” so maybe there actually is a little forward thinking there? “Robot Monster” was directed by a man named Phil Tucker, who didn’t do much else with his career. He has a few other directorial credits on films like “The Cape Canaveral Monsters” and “Dream Follies,” but nothing particularly notable. He popped back up briefly in the 1970s as an editor and production manager, working on movies like “King Kong (1976),” “Orca,” and the “Wonder Woman” television show. 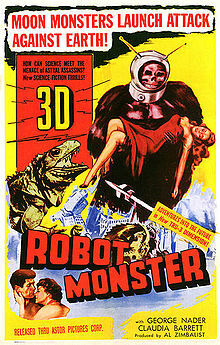 In the acclaimed book of film failures, “The Golden Turkey Awards” by the Medved brothers, it is stated that Phil Tucker attempted suicide after the abysmal critical reception to “Robot Monster.” From what I could find, this a bit of a bending of the truth: it is reported that the film’s distributor refused to pay him for his work on “Robot Monster,” which left him unemployed, broke, and in general dire straits. In addition to his history with depression, all of these factors apparently culminated in his suicide attempt in December 1953. The writer of “Robot Monster” is listed as Wyott Ordung, who likewise doesn’t have a whole lot credited to his name. He had a few directing credits, specifically “Walk the Dark Street” and “Monster from the Ocean Floor,” but didn’t do much at all outside of the 1950s. 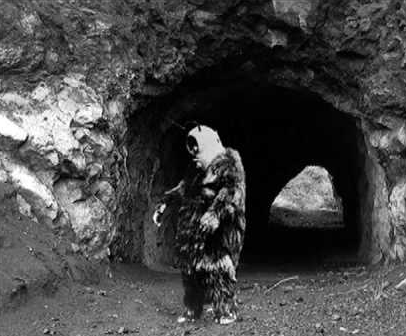 “Robot Monster” was filmed at Bronson Canyon, a particularly famous B-movie filming site outside of Los Angeles that has seen the likes of “Eegah!,” “Army of Darkness,” “They Saved Hitler’s Brain,” “The Searchers,” and countless others. “Robot Monster” has the distinction of having been filmed almost entirely at that location, with only one sequence being filmed in a nearby residential neighborhood. You will probably recognize the cave from “Robot Monster” as being the same one used for external shots of the Bat Cave in the Adam West “Batman” television show. A handful of clips from other films are used throughout “Robot Monster,” including a number of shots of stop motion dinosaurs from “Lost Continent” and a sequence of lizards fighting from “One Million B.C.” to make up the perplexing catastrophic conclusion. Overall, “Robot Monster” is more than deserving of its reputation, regardless of how you want to interpret that statement. The film is a showcase of incompetence at every level, and the end result is absolutely entertaining. For bad movie fans, this is a must see. “Robot Monster” is essentially a foundational work, on the level of “Manos: The Hands of Fate” and the more notorious Ed Wood films. Particularly for monster movies, this stands amongst the elite of the awful. Killer robot week is a great idea! 2015 is a big year for killer robots: Ultron and Chappie look to be heavy hitters, so it made sense to take a look at their cinematic forebears. Also, who doesn’t love a killer robot movie? I don’t see a mention that it’s in 3D!